I am a big fan of using hip quivers for hunting. I have been using a hip quiver for several years, but have been contemplating going back to a bow-mounted quiver. When I came across the Sidewinder Hip Quiver Adapter (HQA) I was very interested in giving this product a try. The Sidewinder HQA is made from a plastic material that is lightweight and strong; it is not bulky either. The arm of the Sidewinder rotates 360°, which allow the arrows to be carried in various positions. 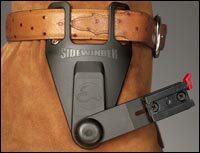 The Sidewinder HQA needs a belt; a leather belt works really well, but a military (nylon) trouser belt will work just as well to carry the Sidewinder. The Sidewinder HQA needs to have a Kwikee Kwiver bracket attached to it so it can hold a Kwikee Kwiver. Stainless steel hardware is supplied with the HQA to attach the bracket to the arm of the HQA. After getting our Sidewinders set up for the Kwikee Kwiver I was ready to try it out. After arriving at our hunting spot I “strapped” on my belt that held the HQA. I was getting a few things together and after a few minutes didn’t realize that I had it attached to me. I headed out to my stand and began moving the Sidewinder in different positions to see what would work best for me. Personally, I like carrying the quiver with the arrow fletching back and slightly pointed downward. As I was walking through some of the thick brush on the ranch and carrying the arrows in the above mentioned position, I was able to maneuver through without any problems. Once in my ladder stand I removed the belt and placed it around the big oak tree. I was able to adjust the Sidewinder’s arm to a position that I could easily remove an arrow from it and it was secure at the same time. I prefer the fletching down and on my right side. After I was finished hunting that morning I decided to drive to a different spot on the ranch. I always had to remove my other hip quiver before heading off, but with the Sidewinder there is no need to remove anything but the quiver itself, rotate the arm and drive. It won’t interfere with your seat belt either. The Sidewinder HQA is suitable for a round of 3-D as well. The arrows are readily accessible, position the fletching out of the way and they won’t “flop” around like a traditional 3-D quiver. The Sidewinder HQA gives you the ability to be versatile. I, like many others, don’t shoot a bow with my quiver attached. The Sidewinder allows you to remove the quiver from your bow and place it on your hip, when hunting, and keeps the extra arrows close by. This is a great piece of equipment to add to your gear bag. What could make the Sidewinder HQA better? Nothing, but It would be really cool if they came in a camouflage type pattern. Over all I rate the Sidewinder Hip Quiver Adapter with 5 stars. If you have ever considered a hip quiver, give the Sidewinder Hip Quiver Adapter a try.